NEW PATTERN AND LISTING!! This is the listing for the 3' Version of Chained Star!! These hand-painted Barn Quilts are very rustic and will look awesome hanging outside on a house or garage or used as inside wall decor as well! Available in many patterns and colors, this particular pattern is Chained Star and is for the 3' size. Pictured colors are Warm White, Red Pepper, Light Mustard, Light Teal, Gray Tabby and Dover Gray. Please note that normally all of my quilts have a painted black border IN ADDITION to the black frame. It's my signature look. However in this instance, the border and frame are painted gray. 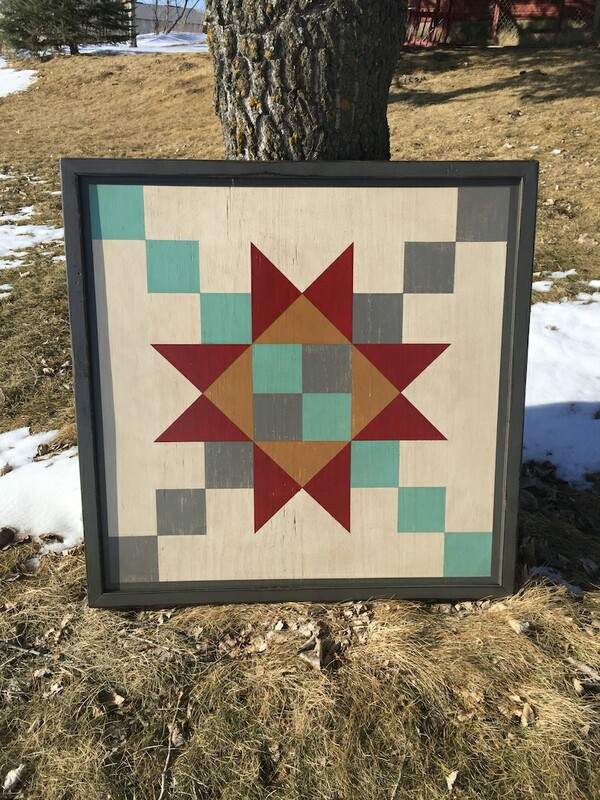 The width of the painted border is determined by the size of the quilt and the pattern of the quilt, so there may be a slight difference in the look depending on the size of quilt in the photo. Also note that NOT ALL of the quilts pictured have the exact frame style for that listing. Refer to the last picture on the listing for a close-up of the frame and black border.